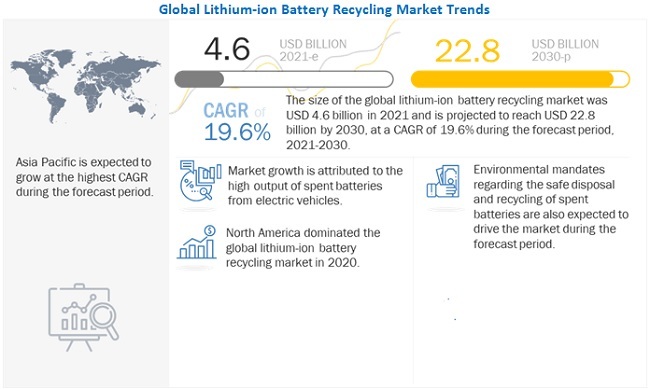 [147 Pages Report] Lithium-ion Battery Recycling Market size was valued at USD 1.48 Billion in 2016 and is projected to reach USD 23.72 Billion by 2030, at a CAGR of 22.1% during the forecast period, 2017 to 2030. For company profiles in the report, 2016 has been considered the base year. In certain cases, wherein information is unavailable for the base year, the years prior to it have been considered. The research methodology used to estimate and forecast the lithium-ion battery recycling market began with capturing data on key vendor revenues through secondary sources, such as Hoovers, Bloomberg, Chemical Weekly, Factiva, and various other government and private websites. The vendor offerings were taken into consideration to determine the market segmentation. After arriving at the overall market size, the total market was split into several segments and subsegments, which were later verified through primary research by conducting extensive interviews with key personnel, such as CEOs, VPs, directors, and executives. Data triangulation and market breakdown procedures were employed to complete the overall market engineering process and arrive at the exact statistics for all segments and subsegments of the market. The breakdown of profiles of primaries is depicted in the figure below. The lithium-ion battery recycling market has a diversified ecosystem of upstream players, including OEM’s, along with downstream stakeholders, vendors, end users, and government organizations. Companies operating in the lithium-ion battery recycling market include Umicore (Belgium), Glencore (Switzerland), Retriev Technologies (US), Raw Materials Company (Canada), American Zinc Recycling (INMETCO) (US), and Battery Recycling Made Easy (US), among others. This study answers several questions for stakeholders, primarily the market segments which they need to focus upon during the next two to five years, so that they may prioritize their efforts and investments accordingly. Scope of the Report: This research report categorizes the lithium-ion battery recycling market based on industry type, chemistry, and region, forecasting revenues as well as analyzing trends in each of the submarkets. The lithium-ion battery recycling market is estimated at USD 1.78 Billion in 2017 and is projected to reach USD 23.72 Billion by 2030, at a CAGR of 22.1% from 2017 to 2030. Growing consumption of consumer electronics and rising investments in the development of electric vehicles are some of the key opportunities for the lithium-ion battery recycling market. Spent lithium-ion batteries are hazardous, and most companies have started recycling these batteries, as, in addition, there is low accessibility to some of the raw materials, such as lithium and cobalt. The lithium-iron phosphate is projected to be the fastest- growing recycling battery type in the lithium-ion battery recycling market, by chemistry during the forecast period 2017–2030. The growing demand for lithium-iron phosphate batteries for high-power devices and equipment, including transportation (EV’s) and lightweight marine batteries is one of the key factors driving the growth of the lithium-ion battery recycling market globally. On the basis of industry, automotive is the largest segment in the global lithium-ion battery recycling market followed by power. Lithium-ion batteries are gaining use in significant numbers for automotive propulsion. Since these batteries offer high energy and power density, there is a growing demand, which is expected to keep them the largest recycling industry during the forecast period. Asia Pacific is projected to be the largest and the fastest-growing region in the global lithium-ion battery recycling market. This growth is attributed mainly to the growing automotive industry in China, Japan, and India. China leads the Asia Pacific lithium-ion battery market and is expected to account for the largest share in the coming years. The factors inhibiting the growth of the lithium-ion battery recycling market include the safety issues related to storage and transportation of spent batteries. 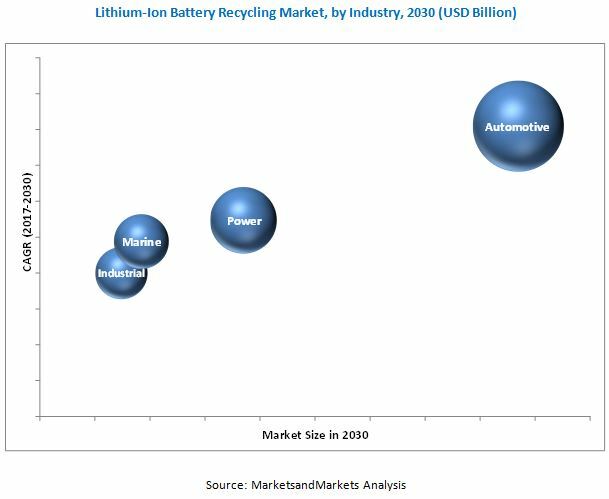 Umicore (Belgium), Glencore (Switzerland), Retriev Technologies (US), Raw Materials Company (Canada), American Zinc Recycling (INMETCO) (US), and Battery Recycling Made Easy (US), among others are the leading players in the lithium-ion battery recycling market. Companies have adopted strategies such as plant expansions, divestments and acquisitions to meet the growing demand for lithium-ion battery recycling and to increase their market shares.